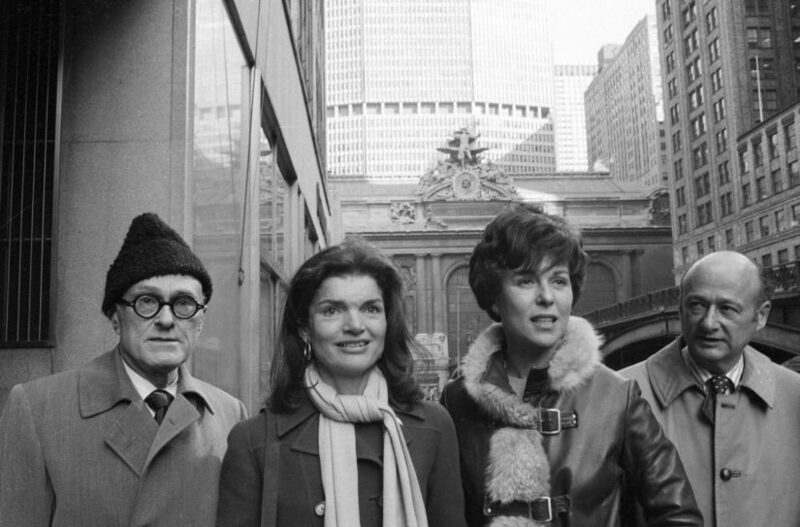 Former First Lady, Jacqueline Kennedy Onassis was instrumental in several important preservation efforts, including the fight to save Grand Central Terminal and St. Bartholomew’s Church. In 1952, Jacqueline met and began dating John F. Kennedy, a young politician. By September 1953, the two were married. With the presidential election of 1960, Jacqueline Kennedy became the First Lady of the United States.3 In her position as First Lady, Jacqueline Kennedy “built her historic preservation legacy” through her restoration of the White House.4 While managing the restoration of the White House, she educated millions of Americans about historic preservation through an hour-long television program on CBS. This project sparked Jacqueline Kennedy’s interest in historic preservation, which she remained dedicated to for the rest of her life. During this campaign the First Lady met with David E. Finley, chairman of the U.S. Commission of Fine Arts, and expressed her desire to preserve the area. For Jacqueline Kennedy, this battle also evidenced the need for legislation regarding historic preservation. She reportedly told Finley she "would like to have Congress pass a law establishing something on the order of Monuments Historiques in France. "10 Jacqueline Kennedy's interest in Lafayette Square and her work to preserve it was ultimately successful.11 Her desire to see a historic preservation law also came to fruition with the passing of the Historic Preservation Act in 1966. Interview with Jacqueline Bouvier Kennedy Onassis by Lyndon Baines Johnson Library. 1974. Robert D. McFadden, “Death of a First Lady: Jacqueline Kennedy Onassis Dies of Cancer at 64,” The New York Times, 20 May 1994. Kathleen P. Galop, “The Historic Preservation Legacy of Jacqueline Kennedy Onassis,” Forum Journal (2006): pages 35-44. Robert D. McFadden, “Jackie, New Yorker: Friends Recall a Fighter for Her City,” The New York Times, 22 May 1994. ”Lafayette Park Revived,” Washington Post, 20 December 1965. Richard Moe and Leonard Zax, “Jackie’s Washington: How She Rescued the City’s History,” Washington Post, 29 May 1994. Robert D. McFadden, “Jackie, New Yorker: Friends Recall a Fighter for Her City,” New York Times, 22 May 1994. Diane Henry, “Jackie Onassis Fights for a Cause: She Joins in Forming a Group to Rescue the Grand Central,” The New York Times, 31 January 1975. Nancy Collins, “Riding the Rails for Grand Central: Jacqueline Onassis, Supporting the Station’s ‘Landmark’ Status,” Washington Post, 17 April 1978. Warren Weaver, “Tower over Grand Central Barred as Court Upholds Landmarks Law,” The New York Times, 27 June 1978. David Margolick, “Church’s Fight on Landmarks,” The New York Times, 31 January 1984. Josh Barbanel, “Landmark Status Debated in Albany,” The New York Times, 9 February 1984. Albert Scardino, “Developer vs. Himself over Colesium Project,” The New York Times, 4 January 1989.